In August 1998 W. Moorcroft Plc. acquired Kingsley Enamels Limited ,a family company with an illustrious history in the specialised world of decorative metal work dating back to 1904. Moorcroft a world leader in the field of art pottery had produced its famous ceramics for more than a hundred years. Rich in history, rich in color, shape and design, Moorcroft has much to add to the line work already produced by Kingsley at the time they joined together. What you see below is a good example of how such a fusing of companies can yield a beautiful new line in the world of enamels. We are delighted to be able to showcase their work. 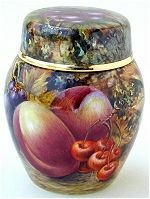 Haselor Lane, a superb limited edition enamel ginger jar is free hand painted by artist Nigel Creed. Comes in a dark blue Moorcroft presentation box. Number 26 from a limited edition of 75. Click on the large photo to see the complete design.